In large skillet, heat oil and butter over medium-high heat. Add onion; cook 5 minutes, stirring occasionally, until onion begins to brown. Reduce heat to medium-low; cook 20 to 25 minutes, stirring frequently, until browned and tender. Meanwhile, heat oven to 450ºF. Unroll pie crust on work surface. Roll pie crust with rolling pin to 12 inches in diameter. Gently press crust in bottom and up side of ungreased 10-inch tart pan with removable bottom. Trim off excess crust. Prick bottom and side of crust with fork. Bake 10 minutes. Remove from oven. Reduce oven temperature to 400ºF. Sprinkle bottom of partially baked crust with 2 tablespoons of the Parmesan cheese. Using slotted spoon, spoon onions evenly over bottom of crust. Top with tomatoes and zucchini, arranging a circle of tomato slices around outside edge, a circle of zucchini slices next to the tomatoes and a circle of tomato slices in the centre. In small bowl, beat whipping cream and egg with wire whisk. Pour over vegetables. Top with Gruyère cheese and remaining 2 tablespoons Parmesan cheese. Bake at 400ºF 15 minutes. 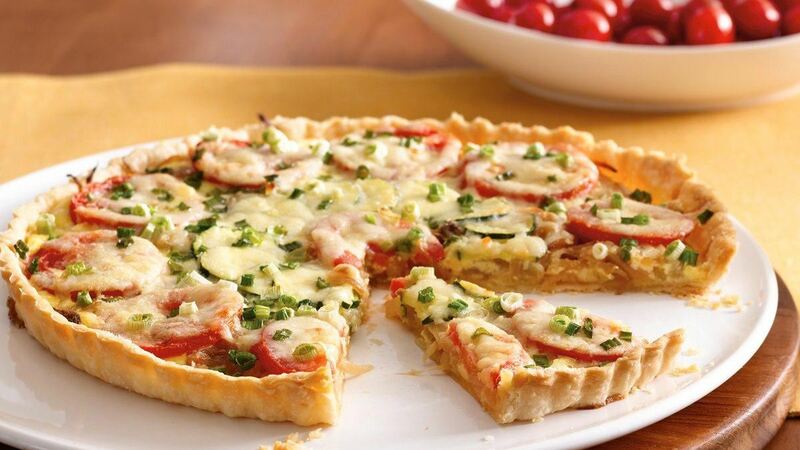 Top with green onions; bake 10 to 15 minutes longer or until filling is set and crust is golden brown. Cool 5 minutes before removing side of pan. Tip: Sweet onions are available most of the year. If they are unavailable, use a large mild yellow onion. Tip: This tart is delicious either hot from the oven or cooled to room temperature before serving.